Why would I need self storage in Brown Deer, WI? There are a variety of reasons why you might need self-storage in Brown Deer, WI. How much is a storage unit in Brown Deer, WI? The cheapest storage unit in Brown Deer, WI is $32.00 per month. What size storage units do you have available in Brown Deer, WI? In Brown Deer, WI we have sizes that range from 5'x10' to 10'x30' to suit your storage needs. How much is it for a 5'x10' storage unit in Brown Deer, WI? The cheapest 5'x10' storage unit in Brown Deer, WI is $32.00 per month. Ideally located just 9 miles north of Milwaukee, the village of Brown Deer is a comfortable, friendly community with quick access to a big-city atmosphere, employment opportunities and entertainment venues. The village is fairly small, and its population has remained nearly stable since the mid-20th century. It has earned recognition from CNN Money as one of the best affordable places to live in the U.S., thanks to the quality of life it offers in tandem with a low cost of living. Brown Deer was originally settled by people traveling from America's East Coast, followed by Irish and German immigrants. Settlers came to the area in search of wide open spaces and fertile farmland, and found the land where Brown Deer now sits to be the ideal location. The nearby city of Milwaukee provided the perfect market for the dairy, lumber and wood products that the settlers produced, and the settlers flourished. Local legend states that the village of Brown Deer was originally named White Deer after albino deer were spotted in the area. 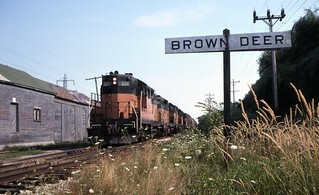 However, the village officially changed its name to Brown Deer when it was separated from the former town of Granville and incorporated as a village in 1955. At the time, the locals reasoned that the name change made sense because brown deer were much more common in the area. Brown Deer offers employment opportunities in several industries, both in the village and in nearby Milwaukee. Along with metal, electrical and machine manufacturing companies, there are a number of financial service companies and retail businesses in the area. Some of the major companies located in Brown Deer proper are Bank Mutual, TAPCO and Badger Meter, while Milwaukee's major employers include S.C. Johnson, Rockwell Automation, Harley-Davidson and Northwestern Mutual. The Brown Deer School District educates approximately 1,600 students in its two schools, which are located on one campus. Brown Deer Elementary School serves students beginning at 4 years of age, including kindergarten through sixth-grade students. Brown Deer Middle/High School serves students in grades seven through 12. The district offers many athletic activities and programs. It also takes part in public school open enrollment. Utilities: We Energies and the village utilities department are the community's primary utilities providers. Garbage and Recycling: You can expect your trash to be collected curbside on a weekly basis. The city also provides recycling and yard waste collection services. Transportation: The Milwaukee County Transit System manages the public transportation system in the area, providing convenient access to the city of Milwaukee. Brown Deer is a relatively small village, but it still offers a wide variety of home styles and housing options. The village's housing market is very affordable, with a median home price that's well below the national average. There are also rental options available throughout Brown Deer, including compact apartments and spacious, single-family homes. Our lowest priced units in Brown Deer, WI average $32.00 per month. 29 people have reserved units in Brown Deer, WI in the past 30 days. There is 1 location within Brown Deer, WI's city limits.